Granite is igneous rock and contains SiO2 with a percent higher than 65%, which are mainly feldspar, quartz and talc, etc. Usually granite is used in sculpture and architecture decoration. To make full use of granite, also for changing waste into valuable, granite can be used in glazing producing, substituting feldspar and quartz. So granite crusher plays an important role in granite powder producing. Major components : SiO2, Al2O3, K2O, Na2O, CaO, etc. What's more, with the features like texture hard and compact, high strength, weathering resistance, corrosion resistance, wear resistance and low water absorption, granite is the first choice of construction aggregate, abrasives, glass, cement, ceramics, agriculture and fillers. YIFAN granite crushers can produce even cubical shape granite sand and coarse granite powder, so it is your best choice for granite crushing production line. Jaw crusher is kind of Granite Crusher which will be the primary granite crusher machine, it’s feed size is usually upto 1000mm, and also the final size of granite dust may be adjusted from 10-100 mm. 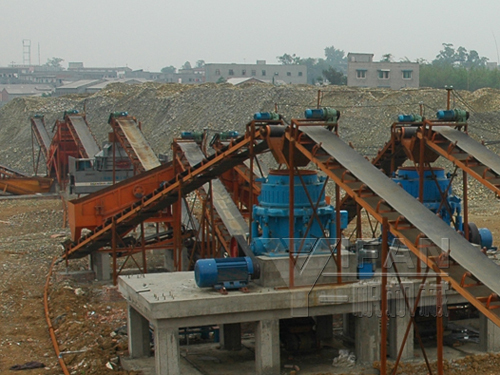 Cone crusher is kind of Granite Crusher which the most common crushing machine in the granite quarrying. 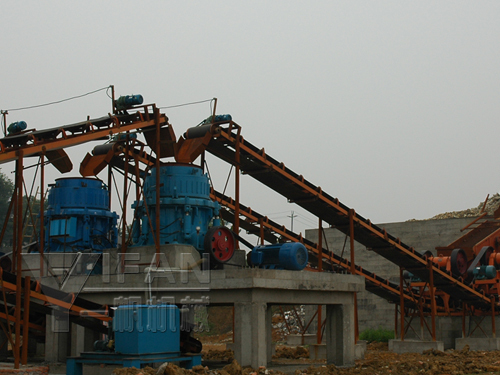 It has four types: spring cone crusher, hydraulic cone crusher, and SMG hydraulic cone crusher. Mobile crusher is kind of Granite Crusher which may be the essential granite crusher equipment, it may unite crusher, belt conveyor and screening machinery. Big granite materials are fed to the jaw crusher evenly and gradually by vibrating feeder through a hopper for primary crushing. After first crush, the material will transferred to cone crusher by belt conveyor for secondary crush; the crushed granite materials will then transferred to vibrating screen for separating. After separating, the parts that can meet standard will be transferred away as final products, while the other parts will be returned to cone crusher, thus forming a closed circuit. Size of final products can be combined and graded according to your specific requirement.